First of all, it is important to point that it is not possible to see the Daily Unique Visitors graph of http://picasa.google.com using Google Trends. Also a big mahalo (thank you in Hawaiian!) to fellow Photo Lover, Katharine Osborne, for showing me Skitch. This great little image capturing & editing tool for Mac has made my blogging much easier. Teaser: what are the differences between the 2 of them? : ) Coming soon! The biggest spike, highlighted with the letter A, happened after the release of Picasa 2.0 by Google, back in 2005 which included a series of improvements such as picture captioning and blog-posting ability (for the whole list check here). 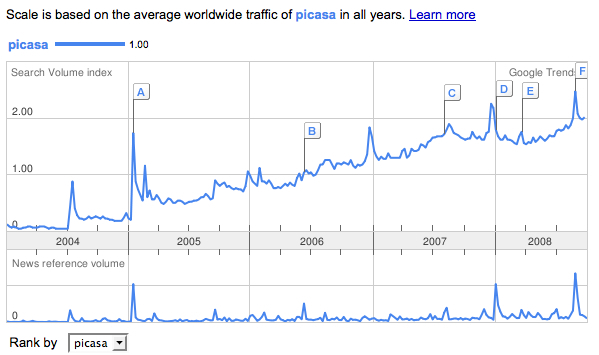 A spike in the search volume of the term “picasa” is expected around the date of a new release. This is supported by event F, because on September 3, 2008, Picasa 3.0 was released. What was really interesting is that the United States does not appear among the top 10 regions where the term “picasa” is searched for!! Notice that there appears no U.S. city on the top 10 cities that search for “picasa” and that English does not appear on the top 10 languages! and I found that English is the 3rd language of the region when searching for “picasa”! The term “picasa” is searched more around the release date of a new version of Picasa. 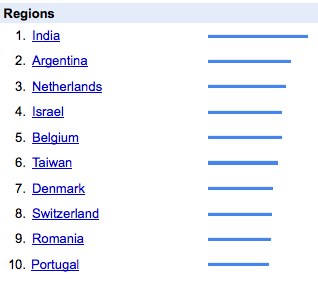 Google’s Picasa has a stronger presence abroad than in the United States. Google MUST consider that the majority of its users come from outside of the U.S., so web sites version in different languages might be needed to support its users. This situation is not strange, the same thing happened to Flickr.com. Why are these conclusions relevant? United States is the second region where most searches happen. 8 of the top 10 cities, where the searches happened, are inside of the U.S.
English is the top language of the queries. This illustrates the difference in strategies between Apple’s iPhoto and Google’s Picasa. It’s simple: Google’s Picasa has a much broader appeal around the world than IPhoto. The U.S. doesn’t even have the highest rate of internet connections in the world; according to the NYT, that honor goes to Iceland or Norway, or some other Scandinavian country that I can’t remember just now. We don’t even have the best or fastest or cheapest internet service; countries in Europe and Asia are ahead of us in that respect. The conclusion is simple, and you don’t need to see Google search trends to reach it, but sometimes it eludes Americans: there is a world outside of the U.S., a pretty big one. Thank you for your comments. 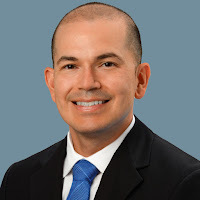 I am originally from Ecuador and I agree with your point of view regarding that the U.S. needs to have a much broader perspective. 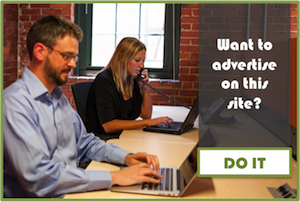 A perfect example that other countries have better Internet connections and are very aware of what’s going on online, is that the website of the company that I work for, has more than 50% of its online visitors coming from outside of the U.S. Both Japan and Germany have contributed a considerable amount of “eyeballs” looking for the latest photo organizing trends in the Mac world.